Looking for private in-home or in-studio Broadway Singing lessons? Our Upland teachers are ready to get you started. Find your teacher today! Check out some of our most popular teachers near Upland, CA including Riverside, Corona, Rancho Cucamonga, Fontana and Redlands. Singing in live theatre requires a set of skills that are very different from singing on film or in a studio. The ability to project (be heard) and to inject emotion and facial expressions into the music so that the audience is drawn into the emotion that you are trying to portray. Singing Broadway songs requires that you don't just sing but act as well. My acting background is in the Stanislavski Method. I also followed Uta Hagen and Stella Adler. ked with children and adults who told me "I cannot sing" and have shown them that, once you understand how your voice works, you can do things you never dreamed you could do. I will work hard to help anyone who has the love and determination to sing to improve and become a better singer. Students I have worked with have won competitions and even been accepted into the AMDA in New York. The voice is an instrument and, like any instrument, you have to know all of its parts and how it works in order to get the most out of it. I teach my students how to properly use their voice without damaging their vocal chords. I teach vocal techniques and exercises to help my students become a better singer. My students will learn how to use their diaphragm; how to use dynamics; how to project; how to build up their lung capacity; how to sing in a clear and articulate manner; how to sing various different types of music; how to control their voice; and how to develop their natural ear for music as well as showmanship. My style and technique has been developed over many years of practical experience and learning from instructors and entertainers who work in the entertainment industry. My method of teaching is entirely my own and I have had a lot of success with it. I expect my students to work hard and be dedicated but I try to make the lessons not just instructional but fun. Home-lessons taught in a designated music room, has an electric weighted keyboard and a karaoke machine. I have recording capabilities that allow me to record my students and blend their voices with the background tracks that we work with. Once a song has been mastered, I record the song and email it to you so you can have it to enjoy and share with family and friends. I teach my students breathing techniques; how to use the diaphragm and relax the vocal chords; how to project; how to properly enunciate; how to perform a song instead of just singing it; showmanship; how to select the music that is right for them. The voice is an instrument and, like any instrument, you have to fully understand it and its different parts in order to get the most out of it. I absolutely loved my first class with Tina. I am very excited to continue voice lessons with her. Tina was fabulous! Incredibly knowledgeable and attentive, my daughter is so excited to learn and train with Tina. Every student is a unique person who deserves a lesson customized to their individual needs. Each of my students prospers in an atmosphere of patience and encouragement. While the lessons are fun and enjoyable, the serious student will be supported in the development of skills leading to a rewarding career. And the more casual students will grow in an appreciation of music that will always enrich their lives. I begin each voice lesson with a warm-up to prepare the student for their session. Next, we do a series of exercises specially designed to help each individual develop their skill in a way that best fits them. We then work on a piece of their choice for the remainder of the lesson, perfecting their technique and helping them become performance ready. I teach with patience and fun because I feel that this is the key to achieving goals and inspiring a good habit of practice. No experience is necessary, that is what I'm here for! I teach legit musical theatre, with an emphasis on classical technique. I do teach how to belt, but I believe in using it sparingly. NOTE: I prefer to teach students ages 11 & up. I will accommodate younger students, but as vocal development is a direct reflection of physical development (the instrument is the body), we will be unable to delve deeply into technique. Instead, the curriculum for younger students will include musicianship and piano skills; they will be more of music lessons that incorporate singing rather than "vocal" lessons. My current studio consists of all sorts of singers including classical, musical theater, R&B, and pop. In classical voice lessons, we will be learning songs not only in English, but also Italian, German, and French. 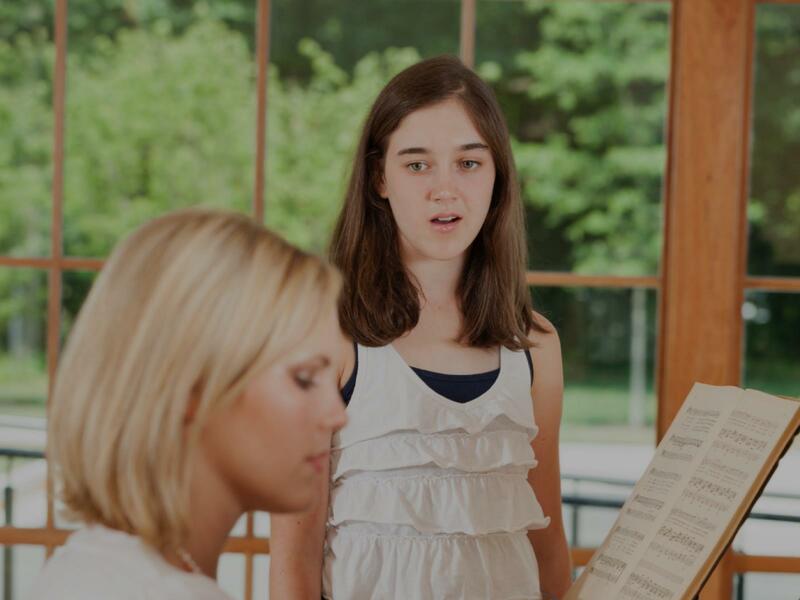 Classical voice lessons may not be for everyone, however, and we will learn repertoire that suits the interests of each student. 's important for a singer to not only know how to sing, but to also understand the music he or she is singing. I will incorporate music theory into the lessons, starting with basics such as learning how to read notes. I believe in making sure the singer is comfortable and confident. The environment you will be learning in is open and non-threatening because a singer needs a place to explore his or her voice. I encourage my students to make mistakes and to keep the lines of communication as open as possible. Singers are perfectionists, and we're constantly telling ourselves what we do wrong- we don't need someone else enforcing that negativity. I concentrate on a classical vocal technique, with proper posture, efficient breathing, lack of facial and body tension, and healthy vocal production. I believe that it is important to have a strong foundation of healthy technique no matter what style of singing. My teaching style and lesson focus will be different for each individual person, and I'm very flexible in adapting to each singer's needs and personality. I am a very understanding teacher, and very patient, but I will push you to work to your potential! What you put into these lessons and your practicing is what you will get out of it. I am not strict, but I do expect dedication, passion, and respect. I am a very enthusiastic and energetic teacher, and lessons with me will be fun, productive, and encouraging. If I sound like the right teacher for you, please arrange a trial lesson to see how well we work together! *Teachers classified as a Student Favorite have taught a minimum of 25 lessons and have received the highest feedback rating from students. I specialize in classical singing- applicable to any style of singing! Belinda did a wonderful job with my daughter. She catered to her strengths and briadened her genre of music in a way that was fun and encouraging. Belinda was fantastic! Very friendly and made me feel at ease learning a new skill, highly recommend. I'm delighted to write a review for Belinda. She's personable, professional and, just as important, very patient. As a beginner I found her explanation of proper breathing techniques extremely useful and an big step toward voice control. I would recommend Belinda without question for anyone hoping to make the transition from "wanting to sing" to "able to perform"! Two thumbs up! I can teach students how to sing musical theater style songs. Students will learn how to use belt, legit, mix voice; how to sing in various musical theater styles ('20s to contemporary); how to develop characterization and drama through singing. I went to UCLA where I received my Bachelor of Arts with my emphasis in Opera Performance. Throughout the years spent at UCLA, I not only continued to sing with choral groups, but also performed in every opera. I sang one of the principles roles in Ravel's L'enfant et les sortilèges, and sang one of the principles roles in many opera scenes such as Dorabella from Così fan tutte, Mercedes in Carmen, Second Lady in The Magic Flute, Nerone in L'incorazione di Poppea. Experienced teacher and performer with a BM and MM in Vocal Performance from Indiana University. I will not only help you improve your vocal technique, but I will help you find your most authentic voice, pick repertoire specifically for you, coach on musicality, audition technique, and career guidance. Your lessons with me are your time to play, explore, and learn the tools to help yourself be the best singer/performer you can be! Hi, I’m Madeline and I’m an opera singer based in Long Beach, CA! I grew up singing and taking voice lessons from the age of 10 and have worked with many different teachers with different teaching styles. I have my BM and MM from Indiana University in Vocal Performance, but I feel equally comfortable singing opera, musical theatre, and jazz. My goal as your teacher is to help give you the tools to become the best you can be: to sing safely and efficiently with proper technique, to emote and present yourself well in auditions and performances, and to prepare yourself for what it takes to be a singer! This should be a fun journey of self-exploration, dedication, and joyous music-making! I’m excited to begin that journey with you! Can't carry a tune in a bucket??? That's what I'm here for! I've had great success with all of my pitch challenged students and they ALL sing in tune now. It's like anything else, a muscle to be learned and trained and ANYONE can do it! And you'll have fun along the way! Can't find a teacher in Upland, CA? "Tina was fabulous! Incredibly knowledgeable and attentive, my daughter is so excited to learn and train with Tina." San Bernardino, CA teacher: Tina B. "Tina B. is amazing. She boosted my daughter's confidence in singing.."
lt Broadway lessons very much and she's helping me prepare for an upcoming audition."